Email marketers are worried. We are worried about people unsubscribing from your lists. We are worried that email service providers are going to blacklist us as spammers. And so we are cautious. We don’t send as many emails as we’d like, because we don’t want to piss people off. But I’m here to make the case that we should be sending more emails. That means more frequent sends. Frequency is the number one reason people unsubscribe. There is no one-size-fits-all approach to email frequency. Studies show that the more emails a person receives from a brand, the more likely they are to take action. Based on the above, it is clear that we need to strike a balance between sending too often, and not often enough. But to air on the side of caution, and send only as many as you believe you can “get away with” misses a large opportunity. Your subscribers will tell you when you reach the limit. As long as you are measuring engagement metrics, you can keep sending more and more often until you reach your threshold. You’ll know when you have sent too much, and you can scale back from there. 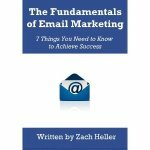 We don’t need to rely on intuition, or gut instinct, or fear to guide our email marketing strategy. We can rely on hard data. If your unsubscribe rate is low, send more. Measure performance. If it stays low, send more. There is no reason to be worried.